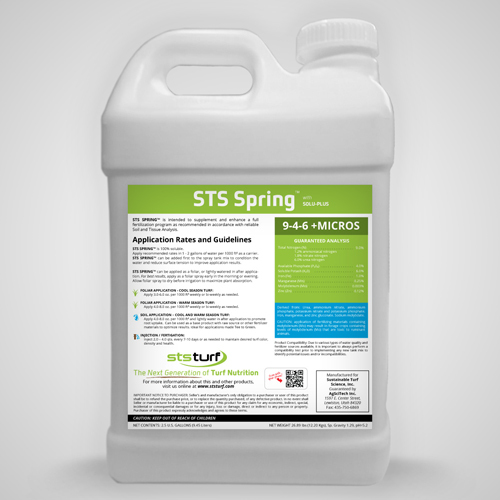 As a specialty product in The Next Generation of Turf Nutrition™, STS Spring 9-4-6 provides a complete macro and micronutrient package balanced to enhance and support spring root initiation in cool season grasses, while assisting warm season turf transition. STS Spring will maximize your turf ’s potential for rooting, chlorophyll formation, carbohydrate production and storage, drought tolerance and energy transfer. STS Spring 9-4-6 delivers 13 of the 16 essential nutrients. STS Spring 9-4-6 also includes our Nutrient Mining Technology™, Solu-Plus, which plays a vital role in maintaining nutrient availability and plant absorption efficiency. Our comprehensive amino acid package will assist your turf in meeting its biological objective; producing complete proteins to optimize plant health. Our proprietary natural plant extracts deliver key phytohormones that promote cell division, or cytokinesis, in plant roots and shoots.